After two successful years of throwing Manila’s wildest parties, bringing world-class clubbing to partygoers day or night and ranking #53 on this year’s DJ Mag Top 100 Clubs list, The Palace Pool Club is turning up the heat this summer as we celebrate our 2nd anniversary! 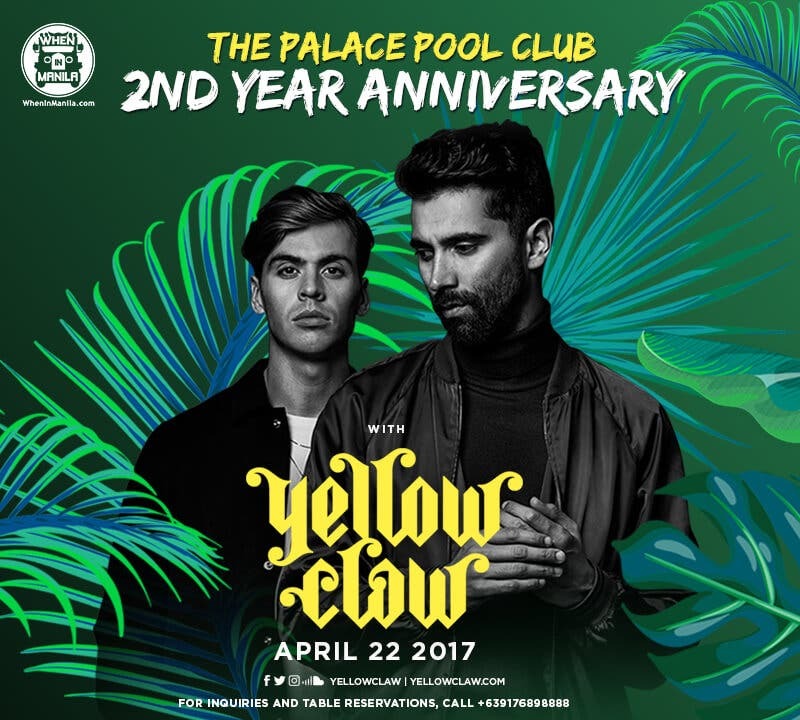 Party with us as Heineken & Globe present Yellow Claw live in Manila happening on April 22! Following an unforgettable gig at Amsterdam’s most famous nightclub the Jimmy Woo in 2010, Jim Taihuttu and Nils Rondhuis, better known as Dutch duo Yellow Claw, would break out into mainstream success and change the world of EDM just a few years later. Incorporating a unique mix of hardstyle, dubstep, hip hop, big room and trap, Yellow Claw’s initial viral singles such as Krokobil, Nooit Meer Slapen, Thunder and Last Night Ever landed them on Dutch and Belgian charts—but it wasn’t until their first international single Shotgun that the group saw themselves performing at Ultra Music Festival, EDC Las Vegas, Coachella, Tomorrowland, The Flying Dutch and Future Music Festival while juggling a residency at the Wynn Las Vegas. In 2015, Yellow Claw released their debut studio album Blood For Mercy under Mad Decent, whose lead single In My Room features DJ Mustard and hip hop artists Ty Dolla Sign and Tyga. The album reached #3 in the Beatport Top Album charts while entering the Billboard Top Dance & Electronic Music Albums and Billboard Heatseekers Albums charts at #1. Their sophomore album titled Los Amsterdam is expected to drop early this year. On top of their worldwide success as record producers, Yellow Claw also manages their own label Barong Family, founded in 2014 and based in Amsterdam. Although previously distributed by Spinnin Records, Barong Family separated from the music monolith in 2015 to become independent. The Dutch label is home to established acts such as Alvaro, Cesqeaux, Mightyfools and Wiwek to name a few. Special thanks to Grab, Starworld, Fox, Channel V, Magic 89.9, Play FM, When In Manila & DJ Mag. The Palace, first established in 2014, is Manila’s premier nightlife and clubbing destination situated in the bustling metropolis of Bonifacio Global City. Named #53 in DJ Mag’s definitive list of top 100 clubs in the world, it is currently composed of four concept outlets: Valkyrie Nightclub, The Palace Pool Club, Revel and Café Naya. The Palace prides itself in bringing only the best, most sought after live acts to Manila, making it the ultimate clubbing experience day or night. 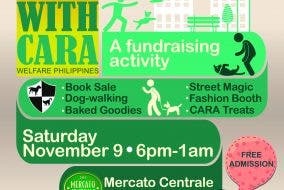 Dog Tales with CARA: Win a 3-Day 2-Night Luxury Accommodation and More!